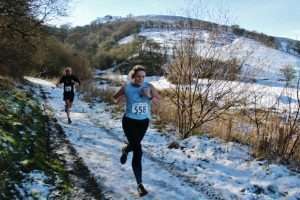 After receiving the email on Saturday, warning of the snow covered course, numbers were down a bit for the fourth of the winter league races. 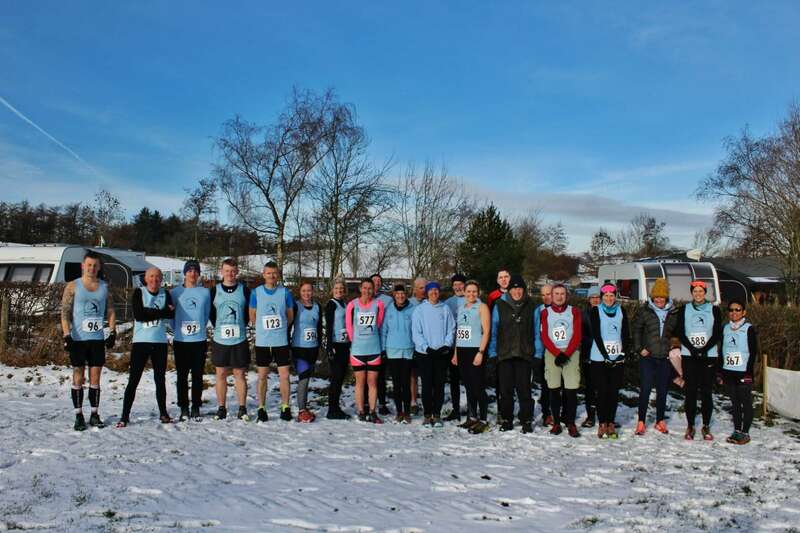 Personally I did think that the snow would have melted a bit on Saturday afternoon and given that there was no snow locally, at least some of the course would be snow or ice free surely? But no, the warnings from Builth were correct and the whole of the course was indeed covered by snow or ice. Actually, now I remember the short stretch through the pine woods was not white, but the tree roots were equally hazardous. Not a race for the faint-hearted, so well done to the nine Croft Ladies who showed up to battle the elements and do Croft proud. The course of the Fforest Fields race has been different every time I have run it and this year was no exception. We started on the overflow campsite, not too far from the cars to allow for a last minute stripping of outer layers. Brave souls were seen wearing shorts and vests, but the majority of runners were prepared for the cold in full body cover. In fact, thanks to Tory who came along to watch and shout out encouragement from the sideline for the info., a lot of runners were stripping off layers at the end of the first lap – it is so hard to judge what to wear when it is cold. Just a brief pre-race intro and we were off. Through to the end of the field, around some ponds and then up a particularly icy stretch of lane to some woods and across some fields. 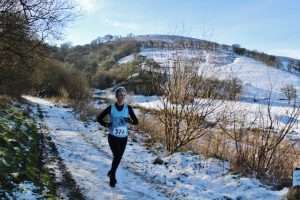 Ice was a potential problem, but as far as I can tell everyone was running sensibly and although there was a bit of slipping and sliding as far as I am aware there were no bad falls and no injuries. There were some ups and there were some downs but on the whole, the ground underfoot was not as treacherous as it appeared and a steady pace could be maintained fairly easily. It was tough but there were some really lovely views as the sun was shining and it was a clear blue sky. I have to apologise. I usually like to hang around near the end of a race and catch up on how everybody has run, but I also get very cold very quickly after a race and that is when the temperature is a few degrees warmer than it was, so I didn’t hang around and hit the lovely warm shower as soon as possible. This means that I cannot really comment on how the race was for other runners. 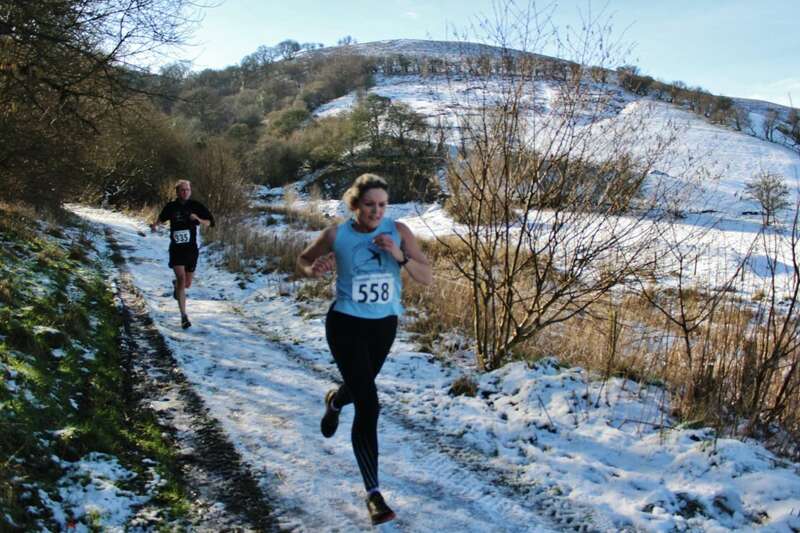 What I do know is Kelly was first Croft lady home in 6th place – 52.38, Gemma M was 10th – 54.28 and completing the Croft team to take second team place was Steph M on cracking form again, first FV45 lady in 58.06. A great result ladies and one which only leaves us 17 points behind the series leaders Wye Valley. They were 21 points behind the leaders – Hay Hotfooters today, so I think we are in with a chance at taking home the trophy at Presteigne, but it will be tough. Fingers crossed for no sickness bugs or injuries for that race. The second Croft team was led home by Jo M, who despite running with a niggling injury for a while, continues to put on a great performance, 60m00 19th – first FV50. Lucy has been getting in lots of miles for her training for the upcoming 18mile round the dams race and that is really paying off. She ran a great race with the help of Jo M’s spare trainers to give a bit more grip than the ones she arrived in – 62.14, 25th. I was the third member of the B-team trying to catch up with Lucy but not able to gain on her, 62.57 28th. The C team was led home by Flora – 65.52, 33th, followed by Louise Reeves 77.56, 46th, and Gemma 80.55, 49th. So onwards and upwards to Presteigne, hopefully to collect a trophy, but its all down to our fastest ladies. Should make for an interesting race. See you there.